Fall is nearly upon us here in the northern hemisphere, and the season is in full swing for family portraits and senior photos. As photographers and their subjects seek to portray ever more interesting environments, they are increasingly shooting on and near railroad tracks. Unfortunately, railroads are private property, so this activity constitutes trespassing, and more importantly, can be very dangerous. I've recently learned of a big push that's being made here in the US by Operation Lifesaver and the rail carriers to curtail this behavior. I'm guilty of this myself, of course. I grew up on a farm that was bounded by railroad tracks, and I spent many hours as a naive youth playing on, around, and under the tracks. Fortunately, the worst injury I ever sustained there came when my young brother whacked me on the head with a railroad spike. I'm just sure it was completely unprovoked. We made it the quarter mile back home, where I got cleaned up and my brother got disciplined. As an adult with a camera, I've returned to those old stomping grounds many times. However, not everybody who wanders into the path of a train is so lucky. Trains are heavy -- often weighing some 6000 tons. Freight trains can travel in excess of 60 mph (100 kph). It can take them over a mile to come to a stop, and nothing that gets in their way will protect its occupants from all that inertia. Far too many people are killed and injured every year when they find themselves in the paths of these indestructible forces. In an effort to reduce these injuries, the rail carriers have partnered with Operation Lifesaver to communicate to photographers both the legal and safety reasons why it's a bad idea to photograph from railroad property. Rail carriers love the good PR that comes from beautiful photos of their trains; they just want those photos to be taken safely. Public property, like the shoulder of a nearby road, makes a far better vantage point for photos of these beautiful machines. The railroads are even going to far as to find photographers who have posted online photos which were apparently taken from dangerous or illegal locations. These photographers receive a letter from Operation Lifesaver and (in our state) the Nebraska State Patrol informing them of the legal and physical dangers of this behavior. The text of this letter is included below. It's important to remember that even though they're out in the open and not behind a fence or (usually) signs, tracks, bridges, and their rights of way are private property. Even walking along the side of a track puts you on the wrong side of the law. Worse yet, photographing minors on a railroad track can even lead to child endangerment charges. Even if the tracks used are "dead," meaning they're no longer physically connected to "live" tracks (those in active use) and are therefore safe to occupy, displaying such photos online can encourage others to trespass onto live tracks in pursuit of similar photos. Consequently, Operation Lifesaver discourages public display of any photo taken from railroad property, even if the specific situation depicted was authorized and safe. "It has come to our attention that photographers in your area are using the railroad tracks as a setting for photographs of students. This is extremely dangerous and can result in charges of child endangerment against the photographer because of the potential for tragedy. "It is illegal to walk, ride bikes, ATV's or snowmobiles on or near the tracks. This is private property. Your customers can be ticketed, fined or jailed, if they're extremely lucky and don't die in the attempt. "It's extremely difficult to judge the speed of a train and your own reaction time to get away safely. In real life, if the train were coming, a person may not be posing for the next picture. They'd be in a hospital, on life support or under a tarp. "It takes a mile to a mile and a half for a train to stop. Trains weighing 6,000 tons don't brake like passenger cars weighing 2,000 pounds. Even if the engineer can see a person down the track, they won't be able to stop, but will witness what no one wants to see. "Trains overhang at least three feet beyond the rail, so a person to the left or right of the tracks is in nearly as much peril as the one in the center of the tracks. Both are in imminent peril and would be hit by a train. "We work every day to avoid these tragedies but still over 500 people were killed and another 500 injured when they were trespassing on or near railroad property. 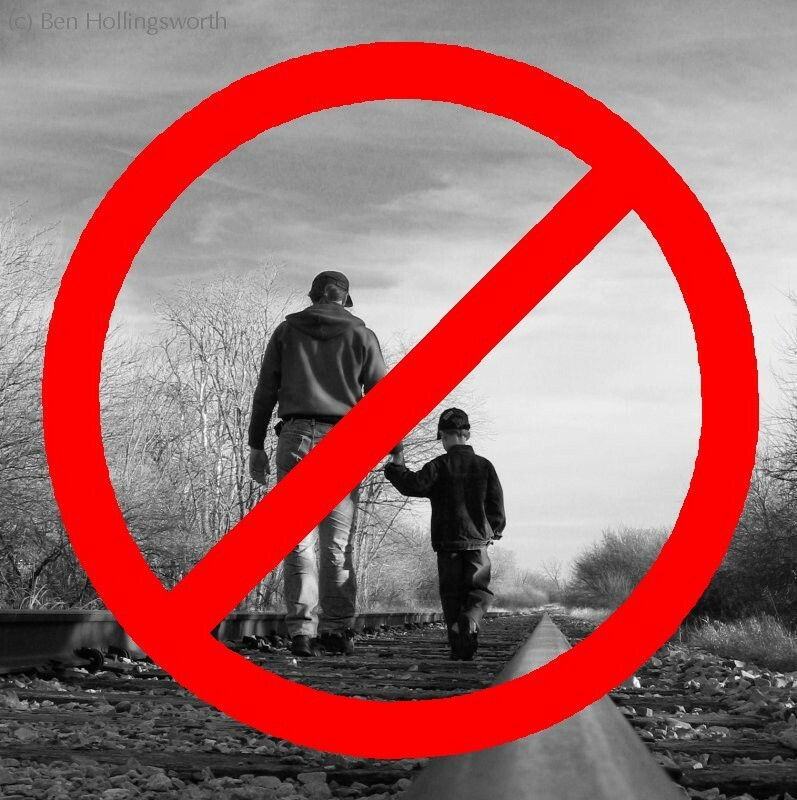 So, please encourage your customers to stay away from railroad tracks, don't encourage illegal practices and when you're preparing for high school photos, please know the railroad tracks are out of bounds. There are plenty of places to use as backdrops; trains and trestles are off limits. We appreciate your assistance with this important matter and wish you and your business a very good year."